Do you regularly find it difficult to fall asleep and sometimes suffer from insomnia? Do you wake exhausted every morning and feel you never get enough sleep? If this is true for you, this course can help you. Take just 15 minutes each day to learn how to restore healthy sleeping patterns and get a sound nights’ sleep. Suitable for all levels, beginners and advanced. This micro-learning course takes a step-by-step, holistic approach to sleep. Each fifteen-minute session looks at the most common causes of sleep disturbance, providing simple, clear guidance on how to re-establish healthy sleep patterns. The course shows you how to prepare for a good night’s sleep through helping you manage stress levels during the day and providing practical advice on good sleep hygiene before bedtime. You will learn how to use your attention, attitude and breathing to help you fall asleep naturally and deeply. 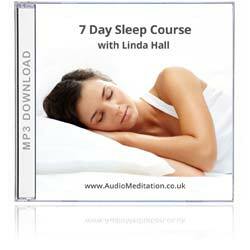 Each session is a combination of gentle coaching followed by a relaxation sleep meditation. The soothing background music contains binaural tones to effortlessly take your brainwaves into Delta sleep state. Learn how to invest in a good night’s sleep through managing your stress levels and taking better care of yourself during the day. Explore the practice of being present to help you prepare for sleep. Learn how to practice good sleep hygiene before bedtime to put your body and mind in the optimum state for sleep. Explore self-care practices that naturally prepare the body for sleep. Learn the most conducive mental attitudes for sleep. Explore the practice of giving yourself permission to switch off from the day. Learn how your attitude towards falling asleep affects your ability to do so. Explore the practice of acceptance. Learn how your relationship with yourself can affect your sleep. Explore self-soothing practices. Learn how needing to control everything can make it harder to fall sleep. Explore the practice of trusting that sleep will come. In this session, we draw together all that you’ve learnt in the past seven days to help you train your mind and body to fall asleep naturally and deeply.